Whiz flour, butter and a pinch of salt in a food processor until the mixture resembles breadcrumbs. Add 1 1/2 Tbsp cold water and pulse until mixture comes together and forms a ball. Divide dough into 4 pieces, enclose in plastic wrap and chill for 1 hour. Grease four 10cm loose bottomed tart pans. Roll out dough on a lightly floured surface to 4mm thick, then use to line tart pans. Trim excess, prick bases with a fork and chill for 30mins. Preheat oven 200c. Line tart cases with baking paper, then fill with weights. Bake for 10 mins. Remove weights and paper and bake for a further 3-5 mins ( cook until pale golden). Reduce oven 180c. Meanwhile, heat the oil in a frypan over med-high heat. Cook the eschalots and mushrooms for 1-2 mins until they begin to soften. Add spinach and cook for a further 1-2 mins until wilted. Drain. Place in a bowl and allow to cool for 1-2 mins and then gently stir through cheese. In a separate bowl, whisk the eggs and cream together with a fork, then season. 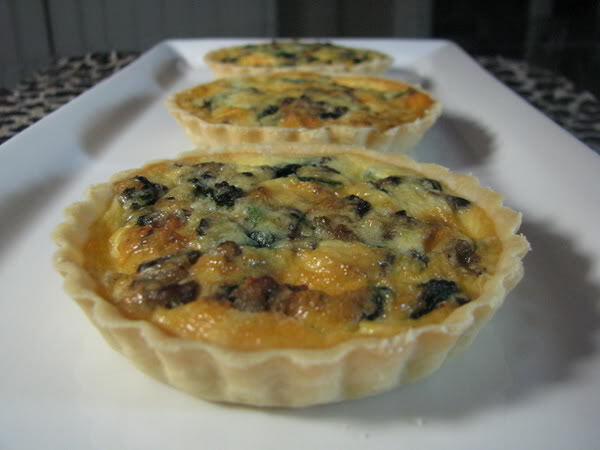 Divide mushroom mixture among tarts, and then pour over egg. Bake for 15-20 mins or until lightly golden. Cool tarts in pans for 5 mins, then serve warm. If Gruyere is unavailable, Jarlsberg, Swiss or tasty cheddar can be substituted.